In a first of its kind survey of real estate transactions being influenced by Internet, Google India has come up with some interesting findings. 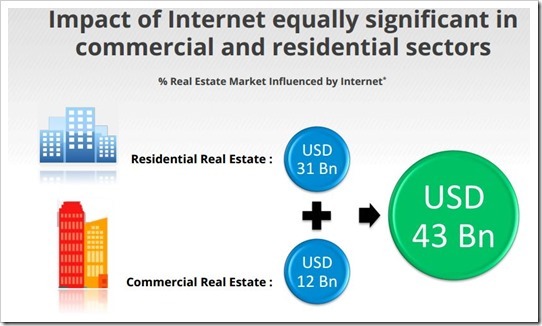 Picture this: Right now, $43 billion or Rs 2,58,000 crore worth of real estate transactions are being directly influenced by the Internet! Considering that India now has the world’s 8th most expensive office location, these new findings on Internet influencing real estate transactions is certainly a very exciting to observe and analyze. The report titled “Real Estate in India – The Digital Influence” is certainly a rich resource for any real estate entrepreneur in India. 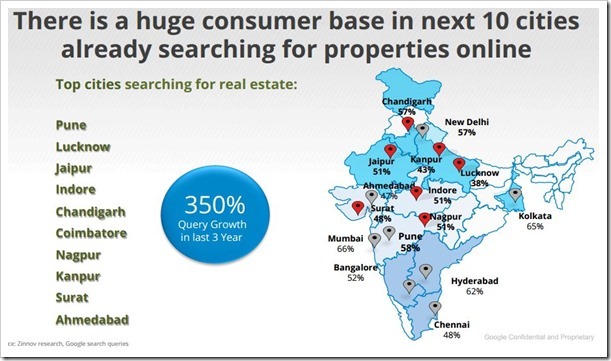 The research is a combination of insights from offline survey conducted by Zinnov across 15 top cities of India along with Google search trends for real estate from 2010 till May, 2014. For their offline survey, Zinnov contacted total of 6196 people who were actually in the market for buying real estate (commercial/residential). Out of that, 3267 people were from India’s top 8 metros and 2929 were from top Tier 2 cities of India. – Organized retail market in India will double by the time 2017 ends. Right now, its $79 billion which will become $140 billion by 2017. Overall, 75% of real estate transactions are of residential nature and 25% is commercial. – 53% of overall real estate transactions are being influenced by Internet today, which makes it $43 billion worth of real estate deals. $31 billion worth of residential real estate and $12 billion worth of commercial transactions are right now happening on the Internet! – Since Q1 of 2011 to Q4 of 2013, real estate related searches on Google.co.in have increased 3 times. Out of every 2 persons, 1 is searching Google to get the best real estate in India. – Out of that, 40% of the searches are happening on mobile, which makes it one of the strongest platforms for real estate queries. Google says that the mobile adaption is doubling every year. – And, 73% of people who use mobile do so via application. If you are a real estate entrepreneur (broker, agent, builder) then you should definitely launch your own application! – 62% of Internet users looking for real estate deals are looking at aggregator websites, which curate content from various sources and display them at one location. 52% of them are checking out builder / developer’s website and 49% of them are checking our super broker’s website. Interestingly, 45% of them are checking our real estate related blogs and forums. – Why does a person go online to search real estate? Because they are now more informed and aware. 52% of Internet users want ease of comparison between different real estate properties; 49% want an easy access to contact details of owners and developers; 60% want easy access to in-depth property information and market trends and 43% wish to have easy financing and processing documents. This is a goldmine of information for anyone wishing to start a new real estate company! – If given a choice between different sources to find information, 53% of them chose Internet meanwhile 54% chose newspapers and 52% chose broker/developer’s office. – Among Tier 2 cities, Pune recorded the maximum percentage of people searching real estate deals with 58% share. Other notable tier 2 cities with lots of internet inclined real estate queries are: Lucknow; Jaipur; Indore; Chandigarh; Coimbatore; Nagpur; Kanpur; Surat and Ahmedabad. – When asked about the brand recall value among real estate advertisements, it was found that 58% of respondents remembered newspaper advertisements while 49% remembered Internet advertisements. Do you check Google before buying a real estate asset? If you don’t you are actually in the minority! "Internet Heavily Influences Real-Estate Decisions In India, $43B To Be Precise: Google", 5 out of 5 based on 1 ratings. Indians Are Least Concerned About Their Privacy Online!